7th CPC : Revision of rate of Training Allowance - DoPT O.M.dated 24.10.2017; No. 13024/01/2016-Trg. Ref. Government of India Ministry of Personnel, Public Grievances & Pensions Department of Personnel and Training [Training Division (IST/IIPA)] Block-4, Old JNU Campus New Mehrauli Road, New Delhi-67 Dated: October 24th,2017 OFFICE MEMORANDUM Subject: Implementation of Govemment’s decision on the recommendations of the Seventh Pay Commission - Revision of rate of Training Allowance. Subject: Implementation of Govemment’s decision on the recommendations of the Seventh Pay Commission - Revision of rate of Training Allowance. (ii) Training Allowance will be admissible only to the employees who join the training establishments for a specified period of time and are then likely to go back. 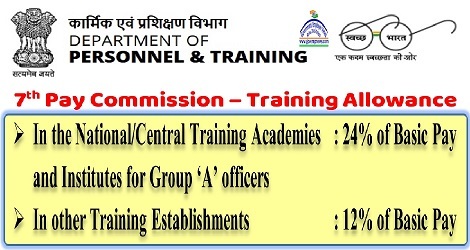 (iii) Training Allowance will not be admissible to those employees who are directly recruited by such training establishments for imparting training. 2. The revised rates of training allowance shall be admissible with effect from the lst July, 2017.